St. Francis of Assisi, a mystic and poet, was also the founder of the Franciscans, an important mendicant order. Zurbarán portrayed the saint in his later years, which Francis devoted to meditating on the suffering of the crucified Christ. The artist's tight focus on the figure is in keeping with Counter-Reformation aesthetics as defined by St. Ignatius of Loyola, who prescribed directness and realism in the representation of religious subjects. Though the figure is modeled with strong chiaroscuro, the variations of ocher tones and distant landscape mellow the intensity of the saint's concentration. E. Clarence Shepard, by 1864. Francisco de Zurbarán was the prototypical painter of the Counter-Reformation, a Catholic reform movement responding to the rise of Protestantism during the 16th and early 17th centuries. His most charismatic works are single figures of saints in meditation or prayer, imbued with great mystical intensity. Illuminated by a single source of light, St. Francis is dramatically isolated against the black background, so that all our attention is focused on him. Magnificent effects of light and dark lend the painting an almost theatrical quality. In the mid 16th century, the gentle, often beardless St. Francis of earlier paintings was transformed into a fervent penitent befitting the new reformist ideology. He was often depicted with a skull as a reminder of man’s mortality, bearing stigmata, the wounds Christ received on the cross. In Spain, this version of St. Francis was popularized by El Greco, who made some 50 paintings of him. 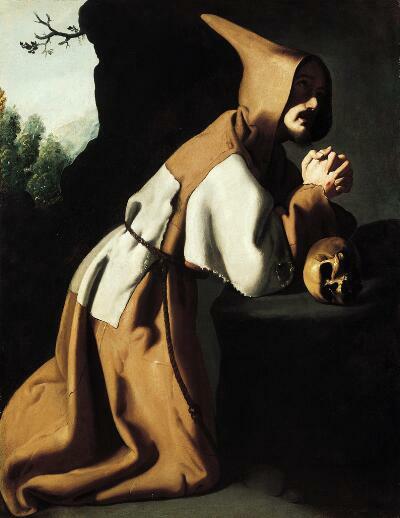 But Zurbarán created the definitive representation of the type in paintings like this one.